There's been a few local snippet stories in the papers of late about Google Maps, a very useful tool, having a bit of a nervous breakdown when it comes to the labels it puts on geographic landmarks. This morning, doing a bit of research into public transport stops on the Auckland Transport site, I found this. 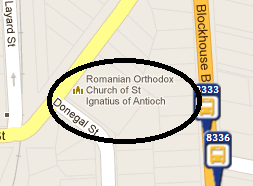 Our Avondale St Judes Anglican Church, there at the corner of Donegal and St Jude Street (guess what the latter street is named after) since 1884 -- now dubbed the Romanian Orthodox Church of St Ignatius of Antioch. There's possibly been a mix-up between the actual local Orthodox church of St Ignatius -- at Alford Street, in Waterview -- and the fact that "St Jude" is mentioned on the Orthodox Church's website. Ermmmm.okay......maybe they need to fix it?